Sunglasses have been a summer staple since they were first introduced to the commercial market in the late 1920s. They’re a practical accessory that offers eye protection and comfort in the sweltering sun. Over time, sunglasses have evolved from something that was primarily used at the beach to a must-have item that you can wear every day. Modern sunglasses come in a wide variety of shapes and styles to suit any man’s personal flair. Whether you’re looking for simple and affordable shades or you want to make an investment in a designer option, you won’t have any trouble finding a product that works for you. One of the most recent trends to emerge from the sunglass market is the use of wood. Wood offers a distinct aesthetic appeal. The material has been used for eons in furniture, utensils, and building construction, so why not use it in fashion? The material is praised for its beauty and versatility. Wooden shades can easily complement a casual outfit on your day off or add a sophisticated touch to the most refined business suit. The possibilities are endless. 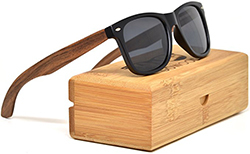 Best of all, wooden sunglasses are an eco-friendly product that offers a range of benefits you won’t find on traditional plastic or metal products. If you’re thinking about getting a pair of wooden sunglasses, you have a lot of options to choose from. Here’s a list of some of the best wooden sunglasses for men that money can buy. 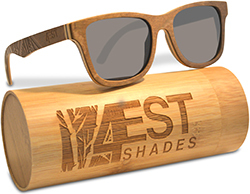 These shades from 4est are made of sustainable maple. They’re designed in a classic wayfarer style and feature etching on the sides. The geometric pattern is trendy and modern. The lenses are polarized and offer UV400 protection so that your eyes stay safe. They also have an anti-reflective coating. The accessory comes with a stylish tube case and protective pouch for safety. One great thing about these sunglasses is the sustainability. For each pair of sunglasses that are sold, 4est plants two new trees. By purchasing these shades, you’re doing your part to protect the planet. If you’re looking for a pair of sunglasses with a rugged look, take a look at this option from Tree People. It’s made from sustainable bamboo and is hand-made by expert craftsmen. The bamboo material has a natural striped finish that looks sleek and modern. The wood is stained to an espresso color for an earthy finish. The lenses are 52 millimeters wide and have UC protection. * The sunglasses come with a protective microfiber pouch. 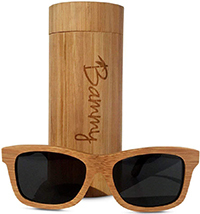 The Bammy Bamboo shades have a natural look that can complement any outfit. They’re made from bamboo and have that unmistakable striped grain pattern. The use of bamboo also makes the product very light. It’s waterproof and floats on top of the water for protection. The lenses are polarized and offer UV protection. If you’re worried about fit, you’ll be happy to know that steel spring hinges are used. They automatically adjust to give you a snug fit. These sunglasses from Ablibi have a more modern flair. It features a half-frame design that partially surrounds the lenses. This portion is made of an attractive clear plastic. Wood is used on the arms. There are a few different wood options available. You can get zebrawood, walnut, ebony, or rosewood. The lenses have a mirror finish and feature UVA and UVB protection. You can also get the lenses with a silver, green, or brown tint to stand out from the crowd. These sunglasses also feature a plastic lens frame. The classic wayfarer profile is made up of a dark plastic. The dark color contrasts the natural walnut arms. To keep your eyes protected in the sun, the lenses are 100% UV protected. They’re also polarized to reduce glare. The lenses are made of a thermal-cured plastic that makes the accessory light and manageable. 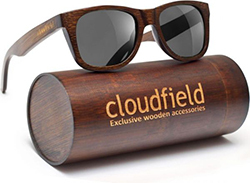 The sunglasses come with a protective microfiber pouch and an attractive bamboo box. 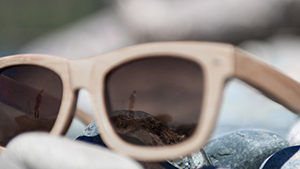 Made from either bamboo or walnut, these sunglasses are lightweight and noticeably durable. The frame is a bit thicker for added strength. The entire frame is made from the natural material. A protective coating on top of the wood keeps the accessory safe while bringing out the grain of the wood. Light plastic lenses are used. They’re polarized and offer UV400 protection. They’re also resistant to scratches for added safety. The shades come in a gift box with a handy microfiber cloth. This unisex offering from Orbitree offers a lot of bang for your buck. 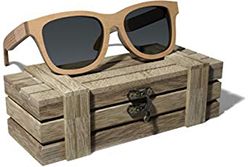 Not only does it contain wooden sunglasses made of maple, but you’re also getting a cool storage case and a complimentary wooden bracelet. The entire frame of the sunglasses is made of maple. The arms feature etched designs. You can either get a checkered pattern or a webbed one. The lenses are tinted and have nine separate layers of polarization. They’re also coated twice for ultimate UV protection. The deep and rich stain of these sunglasses can add a final touch of sophistication to your attire. They’re made out of bamboo and are crafted by hand to ensure that every detail is perfect. Thanks to the natural properties of the material, the shades are tough and buoyant. The shades are designed to prevent glare and provide UV protection. They have nine layers of polarization. They’re also resistant to scratching and distorting vision effects. The sunglasses come as a set with a cleaning cloth and bamboo tube case. 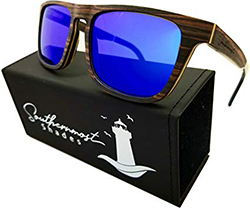 If you want a pair of sunglasses that are thin and easy to manage, this option from Southernmost Shades may be for you. Instead of using a solid piece of wood, 15 layers are pressed together. This helps to improve structural integrity while making the overall profile much thinner. You can see the various layers by looking at the sides of the frame. The lenses measure approximately 55 millimeters wide. They’re polarized, have an anti-glare coating, and feature UV400 protection. Beyond their awesome style, wooden sunglasses have a number of advantages over traditional shades. These unique features set these products apart from the mainstream stylings. 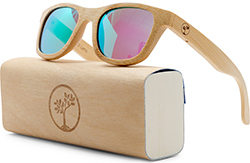 If you’re an environmentally conscious consumer, wooden sunglasses are the way to go. Wood is a renewable resource that can help you reduce your overall carbon footprint. Plastic alternatives can wreak havoc on the environment due to the dangerous manufacturing process. Using wood is greener and doesn’t have the serious impact that synthetic materials do. You can bid your floating lanyard farewell if you use wooden sunglasses. Traditional sunglasses are hefty. The metal and plastic is dense and will sink when placed in water. Wood is a naturally light and buoyant material. If you drop your shades in the pool or ocean, they’ll stay at the surface for easy retrieval. Wood is a material that never goes out of style. There’s a reason why it’s still the most commonly used material in furniture and construction. Wood can be stained and painted to produce a specific color. However, the natural grain patterns offer a distinct look that stands out. When you get a pair of wooden sunglasses, you’re investing in a product that you can use for decades to come regardless of how fashion and trends change. If you suffer from a plastic or metal allergy, you can get relief with wooden sunglasses. The material is soft on the skin and won’t agitate allergies. It’s not uncommon for metal frames to cause discoloration around the ears and nose bridge. With wood, those issues are a thing of the past. Overall, wooden sunglasses are a great accessory that every man should try. However, there are a few disadvantages you need to be aware of. These products do have their tradeoffs, so you’ll need to take these factors into consideration when you’re deciding if wooden shades are for you. 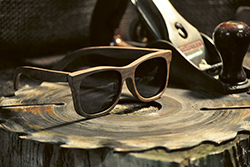 The production process of wooden sunglasses often results in a higher price tag. Many manufacturers make their products by hand. It offers greater flexibility and more quality control. Unfortunately, the time and effort it takes to create these accessories result in a bigger upfront investment. With that being said, the price all depends on the brand and manufacturer. There are plenty of traditional shades on the market with price tags that are much higher than wooden options. Wood is often praised for its strength. However, the material is much more fragile that reinforced metal or plastic. Wooden sunglasses won’t break with normal use, but you’ll have to take a few extra precautions with them to ensure that they last. Many modern manufacturers are working to overcome durability issues with protective coatings. They can bring out the natural finish of the wood and add overall strength. One thing you’re going to have to be wary of on your search for the right shades is imitation wood. Plastic can be made to look like real wood. Some unscrupulous companies will pass their products off as the real thing when they’re actually just cheap knock-offs. The lenses used in the wooden frame will affect how much you see and how much protection your eyes are getting. Some of the most affordable options are standard tinted lenses. They don’t offer anything in terms of UV protection. They simply block light so that you can see in brighter conditions. Alternatively, many companies offer colored lenses. They carry a specific tint that can manipulate what types of light makes it to your eyes. Some examples include blue tints, amber tints, and yellow tints. For the best in protection, look for polarized lenses that offer 100% UV protection. They’re treated to block out harmful rays that could cause eye strain and lasting damaging. The polarized feature is designed to reduce glare. A unique coating is applied to the surface of the lens. It will scatter reflections so that you’re not blinded by the glare that comes off of water, metal, or roads. The type of wood used has can have an effect on numerous aspects of the sunglasses. The wood species plays a big role in how the final product looks. Simple woods like birch or maple offer a traditional wood look while exotic variants like ebony, walnut, or bamboo provide some distinct style. There are thousands of wood species in the world, so finding one that you like won’t be a problem. The wood can also affect price and durability. Some species are more readily available than others. Rarer species will always come with a higher price tag. You should avoid purchasing products made from an endangered wood. Endangered species are usually protected, so the wood was likely collected illegally. Frames often incorporate other components that are made from other materials to improve comfort and efficiency. In most cases, the frame and arms are made out of the wood. The hinges are typically made from metal. While wooden hinged do exist, they don’t offer the same performance as metal. Another supplementary component you may find is plastic. The plastic used is usually limited to nose bridge cushions. Finally, you should take your own personal style into account when shopping for a pair of shades. Fine craftsmen make sunglasses in numerous shapes to fit your face. One of the most common is the wayfarer. This style features a thick frame that surrounds the entire lens. They’re versatile and can complement virtually any look.